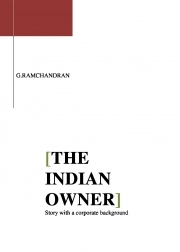 Description of "The Indian Owner (eBook)"
The book is a work of fiction which can be described as a thriller which revolves around the corporate world. This book as of now is free for readers and no price has been set for this. The author of this is Mr. G. Ramachandran is a serial entrepreneur having a vast experienced in the corporate sector. He is also mainly into startups as Mentor Capitalist. Reviews of "The Indian Owner (eBook)"